Yesterday I told you a little bit about our Christmas party that we had over the weekend. This year we decided to have a hot chocolate themed party. I have lots of pictures to share with you and even free printables you can download if you have the urge to throw a seriously sweet party. Cold weather is here to stay, what better an excuse to grab a few friends and sip on something sweet that is sure to warm you up from your toes to your nose! For our party we sent out these invites in the mail a few weeks ahead of time so our friends could be sure to mark the date on their calendars. Jake and I purchased some plain white mugs from Home Goods for really cheap (just over one dollar per mug) and decorated each one differently with a Pebeo Porcelain Pen. When our guests arrived they picked the mug design they liked best, used it for their cocoa throughout the night and then took it home as our gift to them. They were a big hit with everyone, plus they were really fun and easy to make! 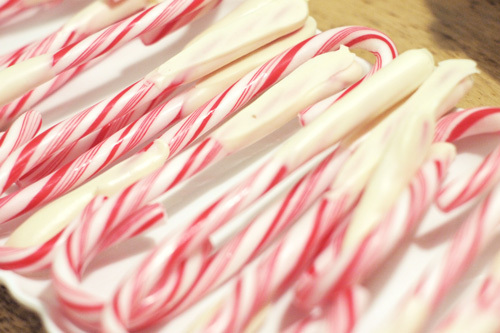 We stocked the hot chocolate bar with candy canes, marshmallows, chocolate filled wafers, and vanilla syrup. 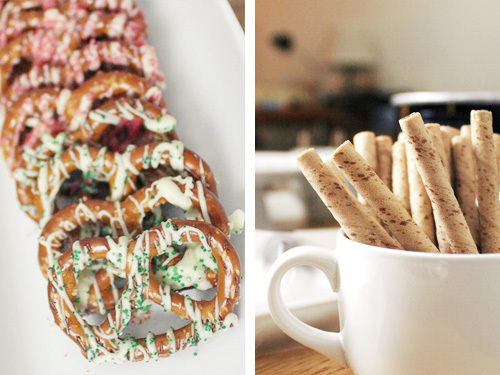 We also served frosted sugar cookies and pretzels to add a touch of salt to all the sweet. 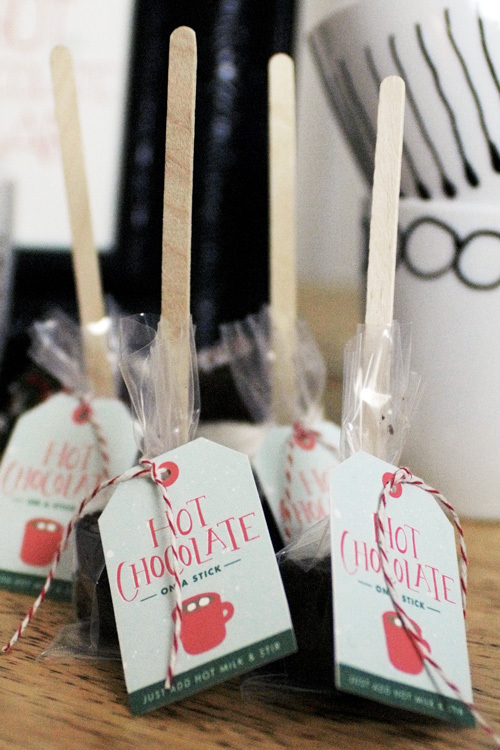 We also sent our guests home with an additional hot chocolate on a stick, wrapped and taged, ready for the next time they’re in need of something warm to drink. I’ve decided I really like throwing parties. Not only do we get to spend time with our friends, but it gives me an excuse to design some cute stuff that I can share with my friends and all of you. You can download and print any of the artwork I designed for our party by clicking on the links below. 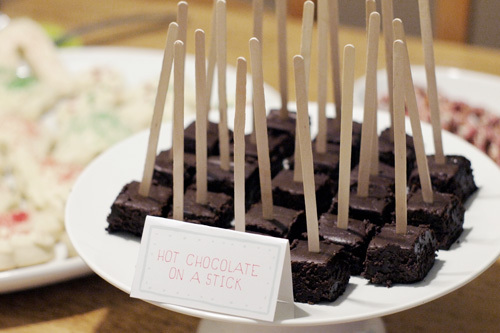 Your parties look like so much fun with lots of wonderful goodies! I love this! 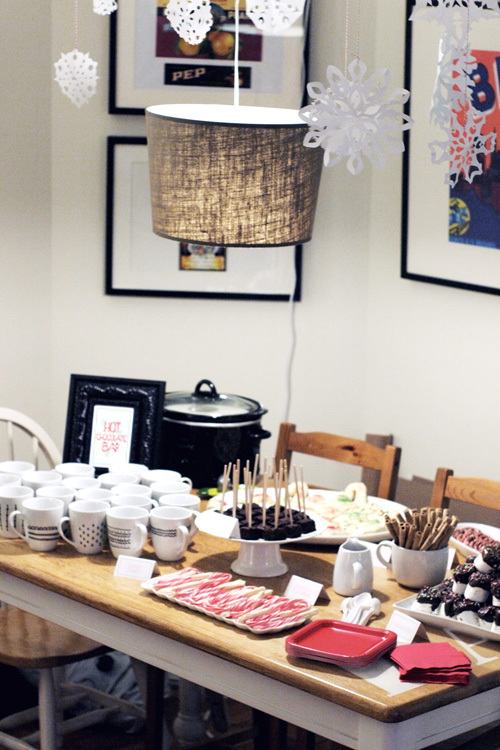 The party looks so cozy and filled with yummy treats! The downloads are just beautiful too. I love how this turned out. The invitations and tags are so cute. And customizing the mugs was genius! Adorable! All of it! I wish my parties looked like this. AAH I love everything about this!! Your friends are so lucky 🙂 I've been wanting to throw some sort of party for a while now… this sparks so many ideas. 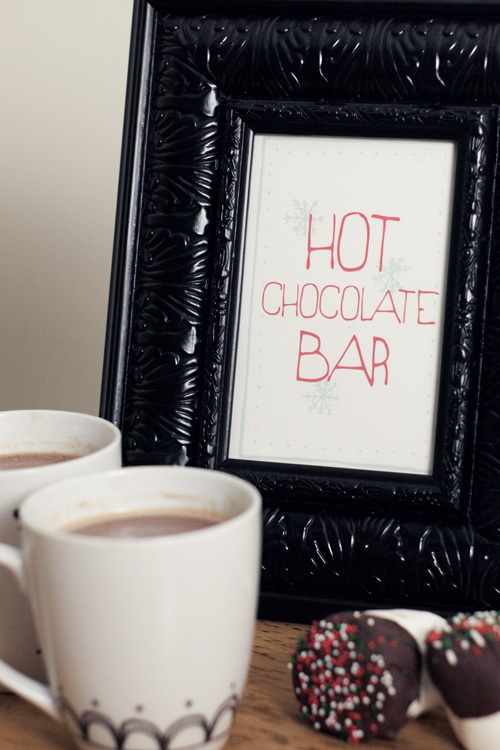 Not to mention you could make it a wintery hot chocolate party, and host it in January or even February. So great! Did you use a ceramic pen on the mugs? We used a Pebeo Porcelain Pen to decorate the mugs. It's a lot of fun! PLEASE tell me where in the world do you get the candy cane striped yarn in the picture w/ the invitation? I had some come on a candle I bought from anthropologie and made a few gift tags with it and am in love! I can't find it anywhere! Tara, its called baker's twine. I just bought a huge roll on amazon for really cheap, but I also heard you can get it at Crate & Barrel too! 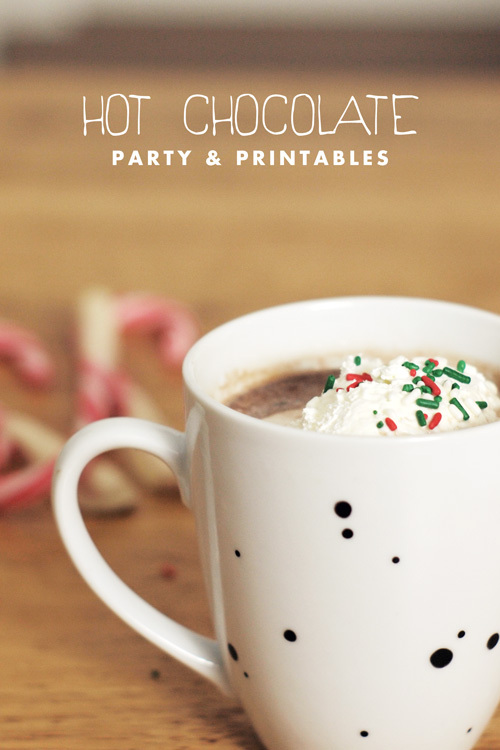 The printables are adorable, but my first question is can I get the recipe for Hot Chocolate on a Stick? I think it would be a nice little treat for my Mother in law. Here is the link to the recipe I used. Love the whole party theme and goodies! Do you have a link for the snowflakes?! We just made them ourselves by cutting up paper. Here is a link to directions if you would like to give it a shot. It's lots of fun because they turn out different each time! I LOVE this! I am so doing this in December. Thank you for sharing! Awesome! I'm so glad you were inspired. It's a lot of fun and our friends really loved it. Can you tell me how you heated the milk for your party? Is that a crock pot of milk in the background? I am just wondering how to do this without heating milk on the stove during the party. Yes I used the crock pot for the milk. It takes a while to get hot enough so make sure you do it ahead of time. Have fun throwing a party! Gonna do this when we have people up for my husband's birthday next week! Thank you! Thank you for sharing. I'm gonna use it for some Christmas gifts. That's a great idea Cecilia! I love this so much! The mugs are so cute, and thank you so much for the printables! Great idea. I just made the cocoa squares and can't wait to try them out. Will be setting this out for this weekend's xmas party. I think I will use your printables too. Thanks! I used this printable set for my sons birthday. Im so glad I found this design because it turned out great. Re – tweaked the invitation to go with our theme. Double thank you. I'm totally using these! 🙂 I'm having a gift wrapping/ugly Christmas sweater/cocoa party and these are perfect. Thanks for sharing. Happy Holidays! Love this idea so much! Definitely copying this!! Thanks for sharing! 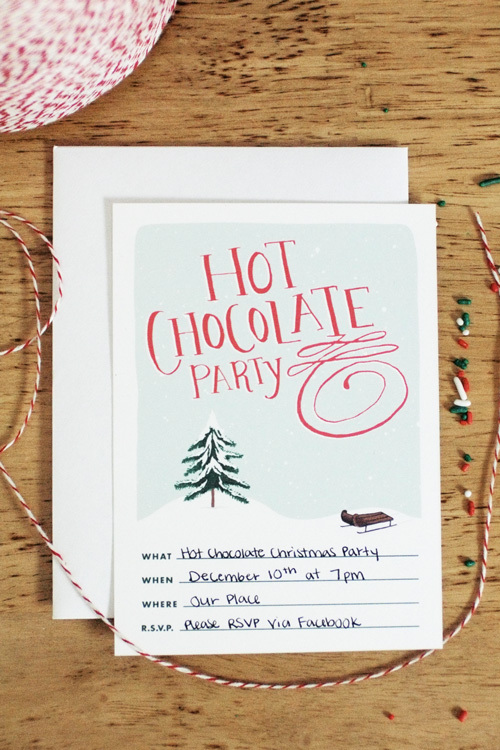 I absolutely love this idea and I'm hosting my own Hot Chocolate Party this Thursday! I adore the idea of hanging snowflakes above the table… I'm planning on makeing some out of old book pages as well, and having red vintage books be a style staple for the decorations. My question is… are the snowflakes attached to the ceiling in your picture, or what? What are they attached with? I would assume masking or mavelous tape would work. Thank you so much for the fantastic idea and the gorgeous printables! I love what you guys do, please don't ever stop! Awesome Brianna! Hot Chocolate parties are so fun. All of our guest loved them so I'm sure yours will too. We just hung the snowflakes from the ceiling with clear tape like you use for gift wrapping. Have fun at your party! They look so perfect, yummy.